Description: To celebrate the 10th anniversay of their debut in Japan, the Sweet Jazz Trio from Sweden (Lassse Tornqvist on cornet, Mats Larsson on guitar, Hans Backenroth on bass) released their 10th CD for the Japanese label Spice of Life. Subtitled "Standard Collection Vol. 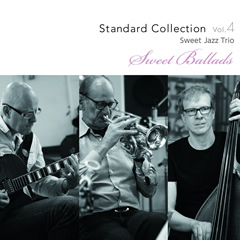 4," Sweet Ballads is just that: a collection of well-known ballads. The performances by the minimalistic trio of cornet, guitar and bass -- note the absence of piano and drums -- are intimate, gentle, masterful, and yes, so very sweet. The beautiful sound of this CD -- recorded "old school" with the musicians in the same room without partitions and using vintage microphones -- matches the beauty of the music and performances. In my mind, this was one of the best jazz CDs released in 2011! Highly recommended! Recorded by Janne Hansson at Atlantis Studio, Stockholm on June 29-30, 2011. If you like this CD, you'll also love the duet by Lasse Tornqvist and Jan Lundgren, Everything Happens To Me.